The Economist generally does a good job analyzing economic and financial data and synthesizing/discussing the results. But once in a while the authors try to pull a fast one on the readers. Here is an example. In the chart below the author argues that the current US unemployment rate is abnormally low. 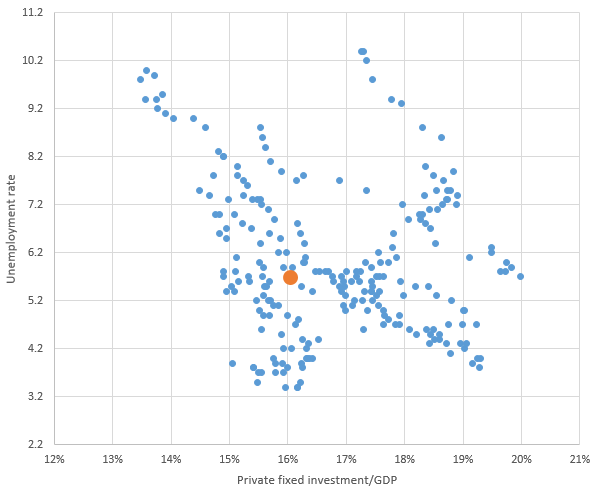 Given how weak fixed investment (buildings, equipment, technology, vehicles etc.) has been, the unemployment rate should be higher than it is. Therefore, the argument goes, the low unemployment rate is not fully capturing the weakness in US labor markets. While this conclusion may indeed be true, the argument is flawed. 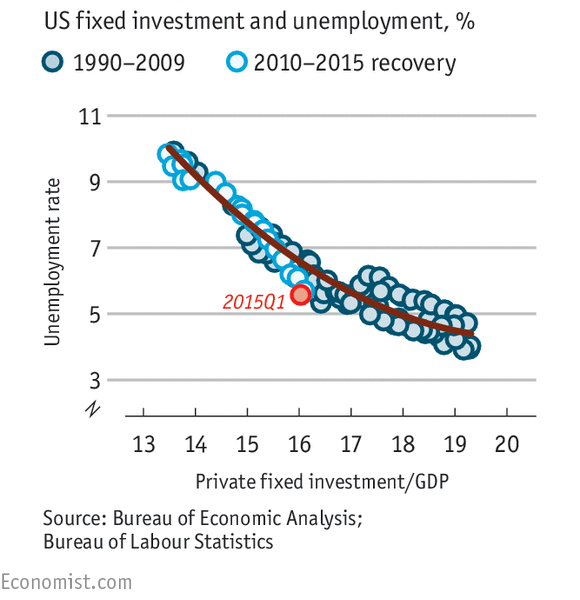 The analysis conveniently uses a period when this relationship between unemployment and fixed investment was strong - driven in part by a massive construction bubble in the US. The reality over the long run is that the relationship is rather tenuous. Here is 60 years of data, with the orange dot indicating where we are today. This goes to show that even the best financial media outfits will periodically try to cut corners.